Do people believe that they are in control of their future outcomes? And how do expectations of what can be achieved affect behaviour? And can we influence this? As the first speaker in the new season of the weekly CSAE Lunchtime Seminar, Stefan Dercon from DFID and Oxford University presented the first exciting results of a field experiment that addresses these questions. The study, conducted in 64 villages in rural Ethiopia, is joint work with Tanguy Bernard (IFPRI), Kate Orkin (University of Cambridge), and Alemayehu Seyoum Taffesse (IFPRI). Their first results show that a simple intervention has an impact on people’s aspirations and behaviour, and that interaction with peers plays an important role in this. This research is part of the iiG research programme, funded by DFID, and was supported by CSAE and the IFPRI Development Strategy and Governance and Markets, Trade and Institutions divisions. 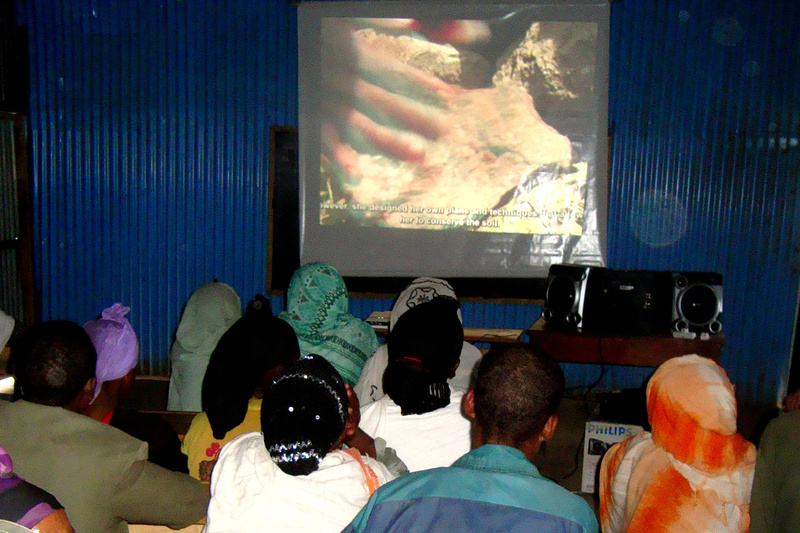 Funding for the documentaries was provided by Seven, as part of the Open Enterprise Solutions to Poverty. Self-image, hopes and dreams matter, not only as part of well-being, but also for the choices that people make. The authors present results from earlier surveys that seem to suggest that a substantial number of poor people tend to choose the fatalistic options when asked whether they think each person is primarily responsible for his or her own success or failure in life or that success or failure is determined by destiny or fate. Furthermore, several studies have shown people fail to invest even though returns are sometimes very high. Aspirations and expectations seem to matter in whether the poor make the most optimal choices. But can aspirations and expectations be influenced? This study tries to answer this question with a simple field experiment. As part of the experiment, six households in each of the 64 villages were shown four inspirational fifteen minute documentaries. These documentaries showed success stories of people with a similar background as the audience and a crucial element in each of these documentaries was that people made a choice that led to success. To control for effects associated to just viewing a movie on a projector screen (and the associated excitement), six households were shown an ordinary (less inspirational) soap instead as a placebo treatment. Finally, in each village six households that were not shown anything were surveyed as well, functioning as the control group. In the first two cases, participants received a bag of sugar after the screening, as an incentive to participate. In half of the villages, 18 extra households were selected to watch either the inspirational video or the placebo video, to assess the effect of having a larger group of peers that have watched the video. “The Model Farmer”. Example of a documentary shown to the treatment group. Funding for the documentaries was provided by Seven, as part of the Open Enterprise Solutions to Poverty. At three points in time, the participants were surveyed: once just before the intervention, once just after and finally after six months. In these surveys, participants were asked about their aspirations (the level they wished to attain) and their expectations (the level they expected to attain) on four measures: their annual income in cash, their assets, their social status (whether people in the village ask them advice on their decisions) and finally the level of education of their oldest child. The authors find that the treatment has a positive and significant impact on expectations with respect to the control group (i.e. the group that did not watch anything) and the placebo group (i.e. the group that watched the soap) on most measures. The effect on aspirations is significant at the 5% or 10% level (depending on the specification) and seems mainly be driven by education. But do these effects on aspirations and expectations also lead to changes in behaviour? The authors take four measures of behaviour: effort (the time spent in work and the time spent in leisure), investment in education, savings and hypothetical demand for credit (how many money they would ask for if an interest-free loan was offered). The last three measures have in common that they capture a “forward-looking element”: they ask about behaviour that has either a cost or a benefit in the future. The authors find a significant effect of the treatment compared to the placebo on the amount people saved (at the 5% or 10% level) and the hypothetical demand for credit. In case of the hypothetical demand, the effect was also significantly different from the control group. Peer effects seem to matter for investment in education and the time spent in work, but not for the other behavioural measures. “The Fast Journey.” Second example of a documentary video shown. The results of the experiment are surprising: an intervention that looks perhaps small and insignificant on paper, does seem to have a significant effect on expectations, aspirations and behaviour, according to the preliminary results. On most measures the impact of watching an inspirational movie is significant from not watching anything. In this case we could speak of a reverse couch potato effect: watching a movie could actually activate people. In case of savings and hypothetical demand for credit watching an inspirational movie is also significantly different from watching a presumably less inspiring regular soap (the placebo). Peer effects seem to matter and it would be great to see a further analysis of these in a future version of the paper. Simon Quinn, the discussant at the seminar, welcomed the paper and raised some questions about the theoretical distinction between aspirations and expectations, and how this can be reconciled with the traditional microeconomic distinction between beliefs and preferences. Stefan Dercon answered that we should see aspirations as an aspect determining the choice set that people consider. Another more practical point raised was the question whether it is useful to increase expectations and aspirations (are people’s expectations and aspirations actually too low?) and whether we should be concerned about Hawthorne Effects: people being overly optimistic, hoping that this will lead to an increase in donor funding. The inclusion of the placebo treatment means that Hawthorne Effects are at least partially controlled for. The authors have just put up a new version of the paper, in which some of the comments from the seminar have been incorporated. This version can be found here. It was an exciting start of the CSAE Lunchtime Seminar series, in which scholars from all over the world are invited to present their latest work on economic development. The Seminar series are held every Tuesday at CSAE. This entry was posted in Policies to Protect the Poor and tagged Development, Education, Rural, Social Networks. Bookmark the permalink. why do we care? when guys watch rocky (specially the first and the second sequels), we feel invincible. but it goes way… what’s the policy here?